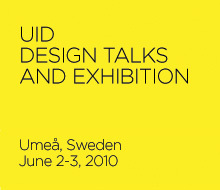 The theme for UID Design Talks 2010 was change, because change is essential and vital in everything we do. To succeed in changing something, for instance oneself, the world, our way of thinking or a situation, we need a vision. Here at UID the students have visions for the future travelling, for changing the way you listen to music, for new ways of communicating over the Internet, for cars competing with transatlantic flights, for different ways of playing games, for compelling ways to get people to think about the environment and for new devices to detect breast cancer, to mention a few. 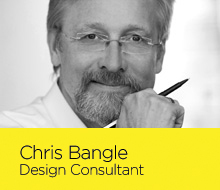 During two days in the beginning of June you could listen to a memorable keynote speech from designer Chris Bangle, follow passionate presentations from our graduating students, and see innovating designs. Simon Fredriksson is developing a tool for the fire service to facilitate the location of distressed people in burning buildings. Julia Stuxgren is working on transforming music to a medium that includes touch, sight and smell – not limited only to hearing. That opens up for a new type of listening that includes people who are hearing impaired. persons with lower limb amputations. The work targets a wide range of users in need of physical activity as a life quality, to enhance the person’s possibilities for social integration with society and daily life. Linda Karlsson’s project focuses on early detection and identification of diabetes-related nerve damage so that complications can be prevented. She is developing a standardization of different methods of measurement on the patient’s soles of the feet for a more accurate diagnosis. Hampus Edström is developing a personal financial aid that will help preventing people to end up indebted. The tool will help the user to manage his/her everyday economy. Jaan Selg is working on a package design for a more secure supply of food to people in need. Mikael Johansen is working on a social communication tool for seniors, a tool that will give them new ways to communicate over the Internet. Nilas Pleje is looking into how to rescue and transport people to safety after accidents or other emergency situations located in difficult terrain during wintertime. Jesper Nilsson is working on how to decrease the fear many children feel before taking a blood test. Is it possible, through helping the children, also to decrease the discomfort before a blood test later in life? Linus Persson is working on how to diversify the way we measure and perceive our everyday exercise in the future, with a focus on young teenagers in school. The project is in cooperation with Sony Ericsson. Rickard Hansson is developing a more flexible solution for manual forest clearance, focusing on aspects such as improved usability, improved ergonomics and better adaptability for the user. Andre Marsiglia is designing a compact kitchen countertop that features alternative applications and layout that make the workflow smooth and practical. Electrolux sponsors the degree project. Oscar Björk is designing a small durable unmanned aerial vehicle that will meet the rigors of daily police use. The function is to provide a tactical overview of the environment in order to assist and increase the efficiency of the police work. Antonio Aguilar is working on his degree project Emergency Mining Rescue, which is a portable first response station for underground mines. Its primary role is to provide underground incident response that allows teams to aid and assist each other. In case of an underground accident, this product is the link between the victim and the rescuer(s) in different situations. Jason Battersby’s degree project Audi One is a timeless sculpture designed to celebrate cultural achievements. This unique vehicle is awarded to and driven by one notable recipient one year at a time. Klaud Wasiak’s degree project, Volkswagen Moog is sponsored by Volkswagen, and is an experimental vehicle inspired by electronic music that suggests the visual and audible language our electric vehicles might have in the near future. Blending the brand’s philosophies with the characteristics of electronic music will also promote a youthful German identity through other markets. Dan Roja calls his project Square 2 Mobility, and the purpose is to build an electric vehicle for sharing set to re-establish an emotional connection with the automobile by changing the context through which it is used. The project is sponsored by the Danish eTrans project. Luis Camino’s degree project, Volvo V70 is a design study for a year 2028 Volvo Estate based on Volvo’s own market challenges and technological roadmap for the next decade, displaying a link to the history and present of Volvo through the logical intermediate generations of the car (2014 and 2021). Yongbang Ho envisions a time when cars can be used for long distance travel with IPT expressway, really competing with transatlantic flights, and his project is called Roadtrip Vehicle. Michael D. Nicola’s project Detroit Soul & Steel is a Corvette designed to commemorate the history, culture, and spirit of Detroit. Jung Young Ho is developing a system that utilizes conspicuous shapes and colours to influence good driving behaviour. 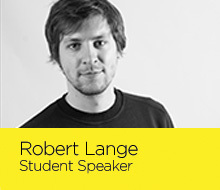 His project is called Advanced Warning System and his goal: to improve road safety. Chris Duff’s degree project is called Adidas Mobility Concept and is a lightweight adaptable vehicle that requires as much from the user as the user does from the vehicle. Lisa Lindberg is developing a lightweight car inspired by art. Vipul Patole is investigating Sustainable Aesthetics. How does a user perceive that a product is sustainable through its aesthetics? Matthias Menzel’s project MissU is about the modern problem couples have in distance relationships. Menzel’s goal is to develop a product that helps couples overcome the distance in their relationship. Robert Lange is working on adapting the dishwasher to new situations. Due to the changes in people’s lifestyle and living environment, the dishwasher has to adapt. The usability is also one of the main factors that this project tries to improve. Anna-Karin Bergkvist’s project is sponsored by Husqvarna AB and is a conceptual machine for planting trees that can live up to the demands of the forestry industry in Scandinavia, while doing the least possible harm on nature and the environment. Earl Pineda is working on a portable imaging device for breast cancer screening for underserved communities in the developing world. Terry Lim Tae-Yeol’s degree project is called Interactive Communication Device to Overcome Language Barrier. Linda Bresäter’s degree project focuses on how to facilitate creativity through the work process within Umeå municipality. Ruedee Sarawutpaiboon is exploring the possibilities that Play can be integrated into city landscape as a social catalyst tool to enhance the quality of life of city inhabitants with the help of new technology. Sisir Sangireddy’s project is called Digital teaching, classroom and beyond and his aim is to explore and suggest digital tools to be used by teachers in creating learning objects. The focus of these tools is mainly teachers teaching creative forms of education and these tools should involve the least amount of adaptation time. Chao Wang is developing a new platform for local Red Cross in Sweden. In collaboration with Red Cross Umeå, this project focuses on how to encourage more people, especially the young, to understand the needs, and to contribute more.